If suffering could be captured in an image, then these photographs would say it all. Early last Friday, three horses were found on a private farm by field service officers with the Humane Society of Washington County (HSWC), a nonprofit organization that contracts with Washington County, Maryland to provide animal control services. The officers were initially responding to a concerned citizen calling about the welfare of pet pigeons. But protocol demands that the officers investigate the conditions for the other animals on the property, as well. 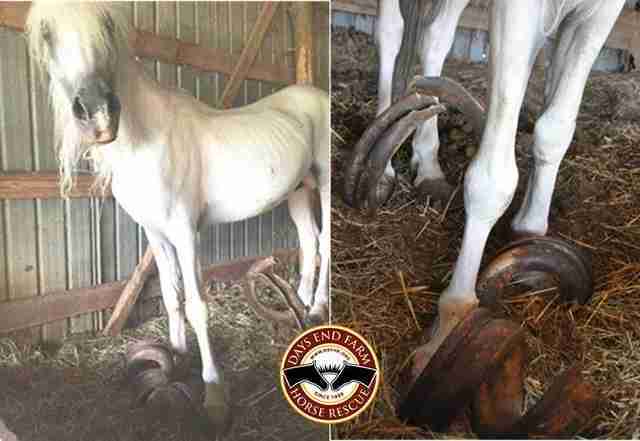 What they found was this: three horses - two stallions and a miniature - confined to individual stalls. They were emaciated. They had rotten teeth. 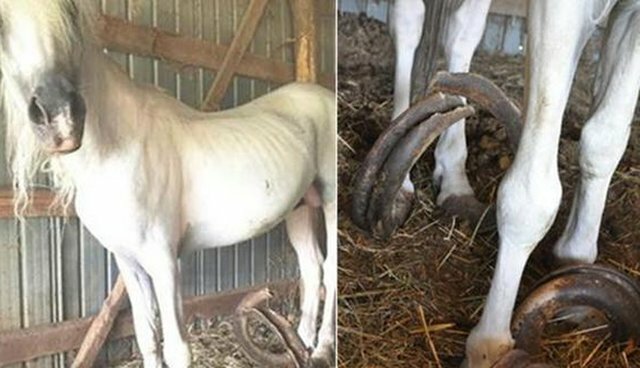 Their hooves, which had never been properly cared for, were more than 3 feet long. And they had been living like this for upwards of 15 years. 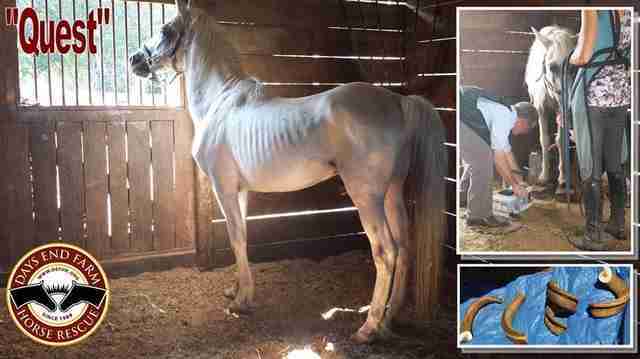 "Our organization has been around 26 years and we have rescued 3000 horses in our history," Caroline Robertson, development director for the Days End Farm Horse Rescue (DEFHR), which is currently caring for the horses, told The Dodo. "From a hoof neglect standpoint, this is the worst case we, our veterinarian and our farrier [who trims horses' hooves] have ever seen." 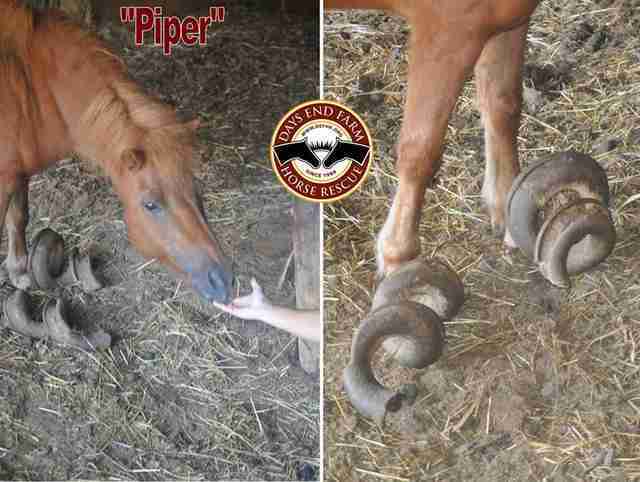 Sadly, one of the horses on the property named Piper had to be euthanized immediately. The other horses, two 18-year-old stallions named Rio and Quest, were transported to DEFHR Friday night. Their condition, according to Robertson, is critical. "There are a lot of factors that come into play with hoof neglect: Ligaments and muscles and bone structures have been compromised for years. This is a slow detriment to their mental and physical well-being," she says. "We are taking this very slowly while their bodies adjust to their new feet and exposures." The horses were transported from the private property to DEFHR by horse trailers, says Robertson, after their excess hooves were removed. "They couldn't be transported with their full hooves because they could have been tangled up with each other," she says. If Quest and Rio survive, they will be introduced to a new world. "Everything for them," Robertson says, "is new." Kim Intino, the CEO of HSWC, told The Dodo that an investigation is currently underway. To read more about Quest and Rio and to donate to their care, please visit Days End Farm Horse Rescue. UPDATE: The Humane Society of Washington County officially filed 15 charges of animal cruelty against Robert Lloyd Baugher and Christine Wilson Baugher on August 27, 2015. The charges focused on the treatment of Quest, Rio and Piper. A court date has been set for October 28. To read more about the charges, go here.